Q:Would like two different initials for adoption ceremony. Is that possible? A:Both cufflinks are personalized with the same 3 initials. 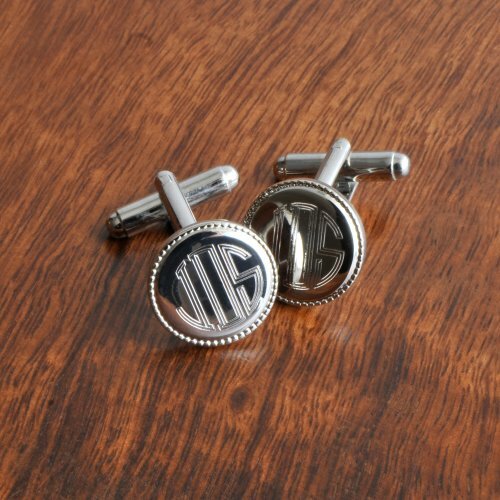 A traditional and classy groomsmen gift, this pair of handsome cufflinks features a three letter monogram. In addition to being a classic element of style, a pair of cufflinks is the perfect complement to a freshly starched shirt. Many grooms ask their groomsmen to wear these personalized cufflinks on the wedding day to add a special touch to the day. Cufflinks are sterling silver plated, embellished with a subtle beaded design. Each cufflink measures 0.63" in diameter. Presented in a plain, black gift box ready for giving. For groomsmen's gifts, dress up the packaging with our tuxedo "thank you" gift boxes. For monogram, please enter the initials in the following order: First initial, last initial (will be center larger letter), middle initial.